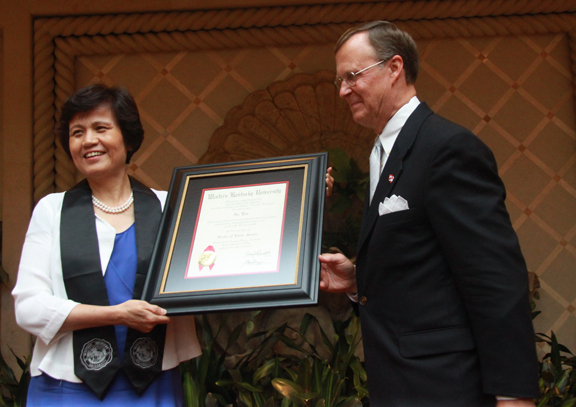 WKU President Gary A. Ransdell presented an honorary doctorate to Madame Xu Lin, director general of Hanban, during a reception Friday evening in Beijing. The recognition celebration for Dr. Xu, Hanban and North China Electric Power University was part of a three-week visit to China by a contingent of 44 WKU faculty, staff and students through the Confucius Institute at WKU. NCEPU is the host site for the WKU group’s visit. 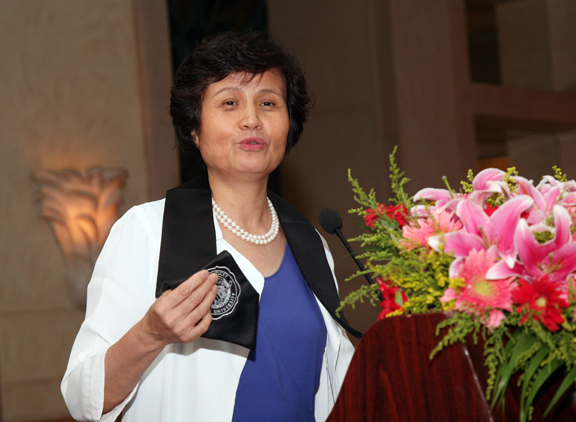 As director general of Hanban, a branch of the Chinese Education Ministry, Dr. Xu is responsible for the vitality of the 322 Confucius Institutes worldwide and an active advocate for the mission to disseminate Chinese culture and languages as a means of promoting understanding between cultures. 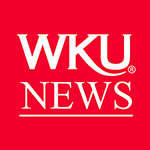 WKU is home to the first Confucius Institute in Kentucky, one of 72 in the United States. 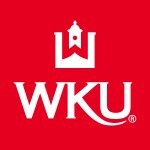 Dr. Xu, a degreed chemist, noted in her remarks that she had been accepted for graduate study at WKU in the 1980s. However, she was awarded a half scholarship and could not afford to move herself and her husband to the United States. At its April meeting, WKU’s Board of Regents approved awarding the honorary doctorate of public service degree to Dr. Xu.